Fixmart supplied the electrical contractor doing the install on the 43-storey tower block for Berkerley Homes plc at Saffron Square Croydon. 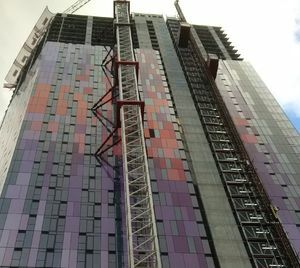 Fixmart supplied the electrical contractor doing the install on the 43-storey tower block for Berkerley Homes plc at Saffron Square Croydon. Formerly Wellesley Square this development is part of a big regeneration project and will be the tallest tower in Croydon providing 414 apartments offering modern living facilities. Croydon with its fantastic transport links is London’s fourth largest retail centre, attracting £1 billion in revenue every year. Over 17,000 sq ft of mixed-use retail, leisure and commercial space located at the foot of the central Tower. Five-star lobby and concierge, available 24hrs a day. Secure underground parking as well as bicycle storage and green vehicle electric charging points. Poetry wall quoting some of England’s greatest poets. Floor-to-ceiling glazing offer residents stunning views across Croydon to Central. The apartments interiors feature a high-specification with contemporary fittings all designed to provide a top quality finish, which had to be reflected in the materials supplied.